The premise of this commentary is to show that Scripture is the only inspired source for understanding the mind of God on this of any other theological topic. The opening quote from the pen of Ellen White asserts that man became confused, simply made a wrong choice in the Garden of Eden and then sinned. The lesson then makes the claim that “the book of Proverbs is all about helping us to make right choices”. The implication is that if we understand the wisdom to be found in the book of Proverbs well enough we will learn to make right choices and avoid what is evil. If this concept of how to avoid sin is to be considered foundational truth we must first address the question of why King Solomon, the author of this book and according to Scripture was the wisest person to ever have lived, fell into sins that we have no record of him having ever repented of? Also, we need to consider the case of Adam and Eve who knew full well that God warned them that they would die on the very day they ate of the forbidden fruit (Gen. 2:15-17) yet they made the choice to do so. Adam and Eve were told and knew the consequence of their disobedience yet they sinned anyway. Solomon, the author of the inspired book of Proverbs, was the wisest person who ever lived yet we have no record of him repenting of his sin. Knowing wisdom not produce the desire to not sin. In the book of Ecclesiastes Solomon expounded extensively on the vanity of what the world has to offer yet he didn't repent of his own sins. Obviously knowing what is ‘God’s inspired words of wisdom’ versus the consequences of what is sin does not, of itself, lead a person into making ‘right choices’. The claim that the study of the book of Proverbs "is all about helping us to make right choices" is false and non-biblical. As we stress both Monday and Thursday when we review Romans chapter seven, knowing what is right or the wise thing to do does not, of itself, give you the ability to choose to do right and not sin. As we shall see, there is only one way to grow sanctification. What Job is saying is that a fear of the Lord where you humbly repent of your sins and turn away from evil is an understanding of wisdom. The question is; why was King Solomon able to record the words of wisdom found in the book of Proverbs yet did not apply this inspired wisdom to his own life? When the fear of the Lord brings you to repentance then the knowledge of God’s wisdom will point you to our Messiah/Savior Jesus Christ. All sinners including King Solomon are dead in their sins. The only hope of salvation for King Solomon, as it is for all other sinners, is in the gospel work of the promised Messiah completed at Calvary. By serving other gods he was rejecting his own recorded ‘words of wisdom’. By his own words (Proverbs, Ecclesiastes & Song of Solomon) it is clear he understood and knew God’s wisdom yet we have no record of him repenting of his sins. What Paul is saying is that in this ‘life of the flesh’ our victory over sin is not our victory. Along with forgiveness of sins this too is a work of our Savior Jesus Christ. From there, we move onto Romans chapter eight and learn that nothing can separate us from the love of God. To each is given the manifestation of the Spirit for the common good. For to one is given through the Spirit the utterance of wisdom, and to another the utterance of knowledge according to the same Spirit, to another faith by the same Spirit, to another gifts of healing by the one Spirit, to another the working of miracles, to another prophecy, to another the ability to distinguish between spirits, to another various kinds of tongues, to another the interpretation of tongues. All these are empowered by one and the same Spirit, who apportions to each one individually as he wills. For just as the body is one and has many members, and all the members of the body, though many, are one body, so it is with Christ. For in one Spirit we were all baptized into one body— Jews or Greeks, slaves or free—and all were made to drink of one Spirit. (1 Cor. 12:7-13). If, at any time we say we do not sin we make God a liar. Victory over the power of sin is also a work of our Savior Jesus Christ through his gift of the indwelling Holy Spirit. The wonder, the joy and the security of knowing nothing can separate us from the love of God through the working of Jesus’ gift of the regenerating indwelling Holy Spirit is the ‘high point’ in a full study of the Epistle of Romans when we focus on chapter eight. It is the intention of our Savior Jesus Christ that Christians worship, fellowship and build up each other within the body of Christ by pointing to him as both our Savior and our Lord through the manifestation of the gifts the Holy Spirit distributes to all Christians. Whatever gift a Christian may have been given it is intended to magnify Jesus Christ as both our Savior and our Lord through the building up of the body of Christ and by revealing the love of God to a lost and dying world. This lesson quote assumes the concept of 'character' and from the context we can assume it is referring to 'moral character'. A common understanding of moral character is a set of attributes that define a person's behavior or habits whether they be understood to be good or bad. Since the lesson alleges that it is the character of a person that causes one to accept or reject wisdom let us follow that line of reasoning and see where it leads us by examining Solomon’s own failure, keeping in mind that this could be restated as; fools are fools because they act foolishly. The biblical equivalent to the character of a person would be where Scripture uses the word ‘heart’. King Solomon applied wisdom to all 'that is done under heaven', meaning he understood and gained 'worldly' success instead of making it a priority to seek after and knowing God personally as his father King David had done. Solomon opt to apply the wisdom given to him by God to the temporal things of life. Towards the end of his life he very 'wisely' concluded that this pursuit had been nothing more than a vanity. Important as having an understanding of godly wisdom is, it is clear from the life of Solomon that wisdom by itself will not 'improve' or change the character of a person. In tomorrow's commentary we will explore what it means to "wholly follow the LORD" as his father King David did. 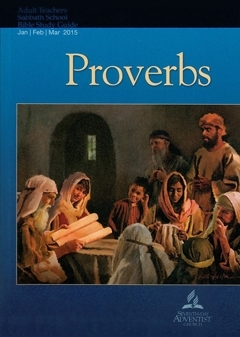 The value of wisdom as outlined in Proverbs chapter two is the theme for today. The opening lines of this chapter of Proverbs are as if they were spoken by King David to his son Solomon. God said Solomon's father King David was "a man after my own heart" (Acts 13:22 & 1 Sam. 13:14) not because he lived perfectly without sin but because his heart condition repented when confronted and convicted of his sin (1 Chron. 21:7 & 8; 2 Sam. 24:10; 2 Sam. 12:13). The same faith in God that gave David victory over Goliath was a total faith in God in all things. He never 'went after other gods' nor did he ever attain a perfect moral character by living without sin in his life. God's gift of wisdom to Solomon was in honor of his father King David before Solomon had ever done anything whether good or bad. In retrospect, when we review the life of Solomon, we see that his 'heart condition' was never the same as that of his father. Solomon went after other gods. The one sin that sets a person apart from those who place their faith totally upon the promises of God is when 'out of the hardness of your heart' you willfully desire and 'go after other gods'. The inspired words of God recorded by Solomon were a gift and blessing bestowed freely by God in honor of his father King David. Solomon failed to apply and obey the very words he recorded. Instead he willfully chased after other gods without any indication in Scripture that he ever repented of his sins. God's promise is that if his words of wisdom are 'treasured up' they will be a "shield to those who walk in integrity", Prov. 2:7. The lesson author is correct in saying that this happens in 'the heart' but seems to have an unclear idea of what it means to have 'a heart after the likeness of God'. The admonition to trust the Lord ‘with all your heart’ and the blessedness of the one who finds wisdom as outlined in Proverbs chapter three are the themes for today. The lesson says much that is good about the benefits of treasuring up the wisdom of God in our heart but fails to address the issue of; how does a person respond to the wisdom of God when trapped by 'the law of sin' and heed the title of today's lesson....'Do Not Forget'? Remember, we are talking about our 'heart condition', not our minds where we are to store up the knowledge of God's wisdom. On the night Jesus was betrayed which led to his death on Calvary he spoke of the New Covenant which would replace the old Mosaic Covenant, Jeremiah 31:33; Heb. 10:16; Matt. 5:17 & Luke 22:20. The Apostle Paul refers to this gospel message as the foundation of the Christian faith (1 Cor. 3:10 & 11) which he clearly defines as the death, burial and resurrection of Jesus Christ in 1 Cor. 15:1-5. Anything added to this gospel message is not the gospel of Jesus Christ, Gal.1:9. Today, we are returning and reexamining Romans chapter seven to make the same point as covered on Monday but to do so in greater depth to further stress the impossibility of forgiven sinners still living in 'this flesh' to choose to not sin via their own self-will. Christ at Calvary which fulfilled the requirements of this covenant. Paul does this through the illustration of a wife being free from 'the law of her husband' at his death. While the Jews in particular, or anyone else for that matter, are no longer under the law contained in the Old Covenant it did and still does serve to reveal what sin is, Romans 7:7. The point Paul is making is that the Mosaic Law of the Old Covenant had both a beginning point which was made 430 years after the unconditional Abrahamic Covenant and ended when fulfilled at Calvary by Jesus Christ, Gal. 3:19-25. One detail often overlooked is that the covenant and the law it contained established until long after Abraham's time could not possibly have been binding upon anyone prior the existence of such law. In Romans 7:8-12 Paul shows how the Old Covenant law functioned within the life of Jewish sinners who were bound by the provisions of the Old Covenant. Although now obsolete he describes the Mosaic Law as "holy and righteous and good". In verse 13 he clarifies that it is not this law but sin that produces death. In-other-words, even though the law is now obsolete sinners cannot escape death because it is sin that produces death, not the law that reveals what sin is. Remember, while intended for edification of all Christians Paul is writing specifically to New Covenant Jewish believers and he is sharing his own experience of growing in sanctification as a born-again Christian. Those sold into the kingdom of darkness do not have this struggle. Sinners may hate the consequences of sin but not hate the sin. Paul is saying he now hates sin itself but personally had found no escape from sinning. As a New Covenant believer 'do not forget' is not an issue. Paul not only knows the wisdom of God and even has the desire to not do that what is evil yet finds no power within himself to avoid sinning. Knowing, even as it is important to know the wisdom of God, is not enough. Having the desire to do what is right is also important but even that is not enough. The question is; are you just like Solomon who knew the wisdom of God but ended up chasing after other gods or are you like King David whose heart was patterned after the likeness of God? All Christians who have an ongoing healthy experience of spiritual growth have surrendered to Jesus Christ as both Savior and Lord. Our Savior's blood which was shed at Calvary forever pays the debt of all our sins, brings each of our dead human spirits to life and ushers each of us into the kingdom of God. Yet, the works of Jesus Christ don't end there. As Lord our Savior now leads us into growing sanctification and victory over sin. As the Apostle Paul shares, even in this we have no power or possible victory through the works of self. The admonition from God recorded by Solomon to "let your heart keep my commandments" embodies what seems to be hidden from many sinners of how to obey God. Important as knowledge is it is the condition of the heart surrendered to the Lordship of Jesus Christ that makes all the difference and not what we know. Even the demons believe the things of God and tremble, James 2:19. While it certainly is important to know what is sin or to know the wisdom that can only come from God it must become much more than 'head knowledge' contained within your mind. From within our present day context this means, first and foremost, to have your sins covered by the gospel message and the blood of Jesus Christ whereby through the rebirth of your dead human spirit via Jesus gift of the indwelling Holy Spirit you have been ushered into the kingdom of God. Forgiven sinners, still trapped within the 'flesh' of this life, can never perfectly overcome sin through a decision or self-willed choice to do so. Instead, we must do as it say in Romans 7:21-25. That is what we must not forget. Scripture does not teach that anyone can of their own self-will overcome sin . Even as we know and understand what is sin the Apostle Paul assures us we must surrender the victory over to Jesus Christ. This is why Jesus is both our Savior and Lord. Only under the lordship of Jesus Christ can there be victory over the practice of sin. Scripture refers to this as growing in sanctification and is an ongoing work that is not of ourselves. The question appears to be comparing what it says in Prov. 1:7 to that of 1 John 4:18 since it is part of this week's study material. In Prov. 1:7 those who fear God in a way that leads to repentance have a heart condition that leads to wisdom. Whereas fools, in the hardness of their hearts, are unable to understand and therefore reject the wisdom of God. What it is saying in 1 John 4:18 is that the fear of God that leads to repentance culminates in the casting out of all fear because fear cannot coexist with the perfect love we experience from within the embrace of our Savior Jesus Christ. The consequence of belief in the heresy of the doctrine of Investigative Judgment is that there is no way to experience the love of God that casts out all fear and retain a fear of the unknown verdict of this judgment. What is needed is to place your faith on the biblical gospel message and receive a heart patterned after the likeness of God. Then cast all your failures and fears upon your Savior Jesus Christ who casts out all fear. Then you will experience the heart-centered knowledge that nothing can separate you from the love of God, Romans 8:31-39.